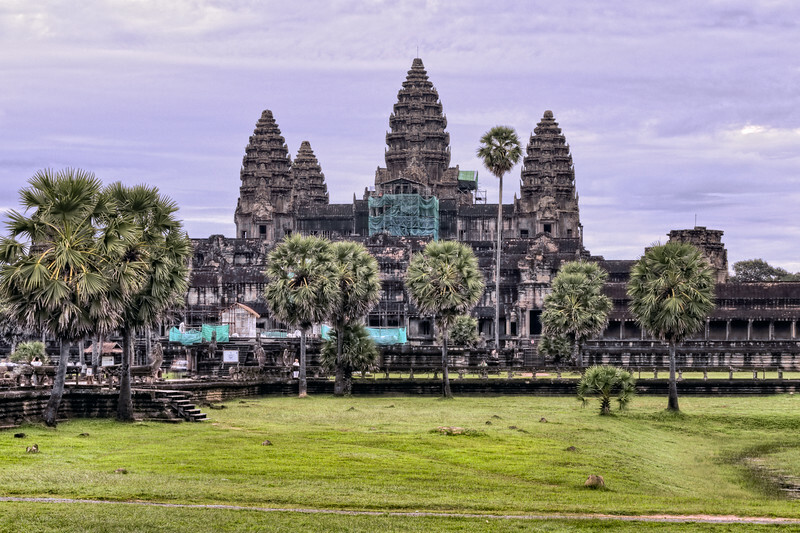 For those who know what / where Angkor Wat is, this particular temple probably comes to mind. 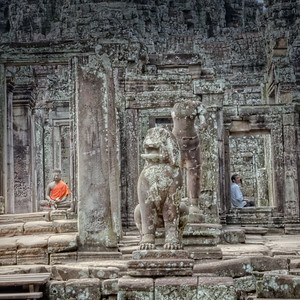 It is definitely the most popular and photographed of all the temples. Everyday hundreds of tourists wake up well before sunrise to take a picture of the sun rising over this temple. We joined the other tourists in 2010 but after most captured their photo and moved on to the next temple, we stuck around and had the temple all to ourselves. It was an amazing feeling and before we moved on I took this photo of the back of the temple. 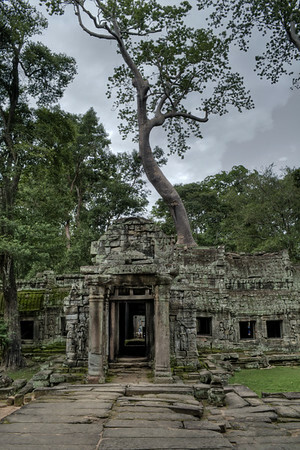 This is the front view from the famous (and much photographed) temple where a massive tree has grown right out of the middle of the temple. 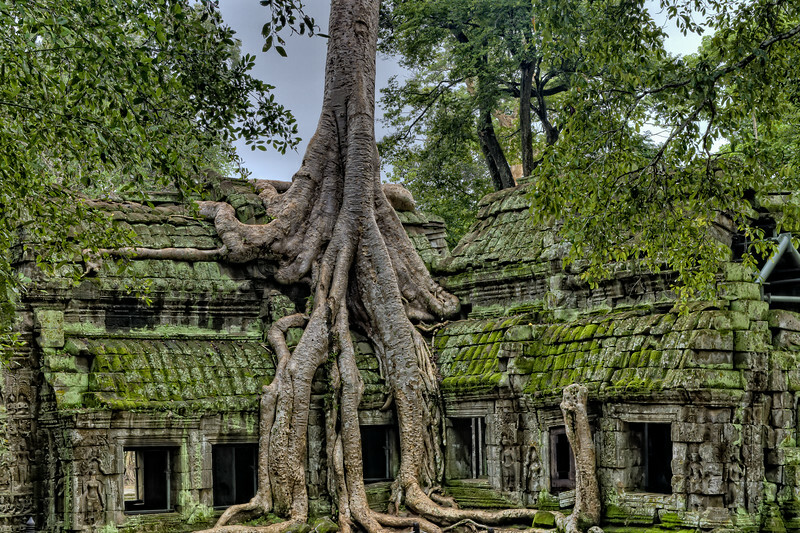 The tree is growing on the roof but the roots follow down the walls of the temple. 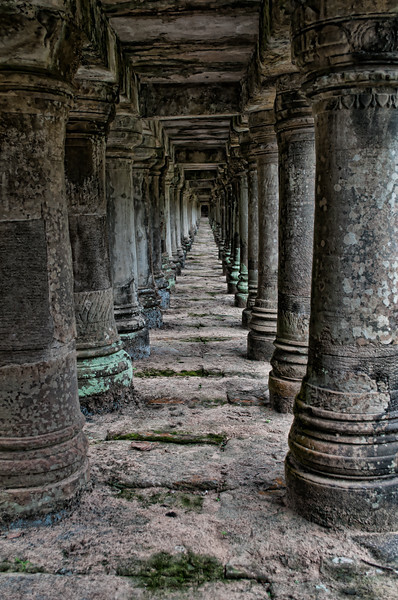 I took this one underneath a bridge leading to a large temple at Angkor Wat. The temple was surrounded by water back in the day and this pillars carved out of rock held up the bridge to enter. It is so impressive that they have stood the test of time and every day tourists walk directly above where this photo was taken to enter the temple. This statue overlooks the side of the temple. It has a great view of the surrounding forest. 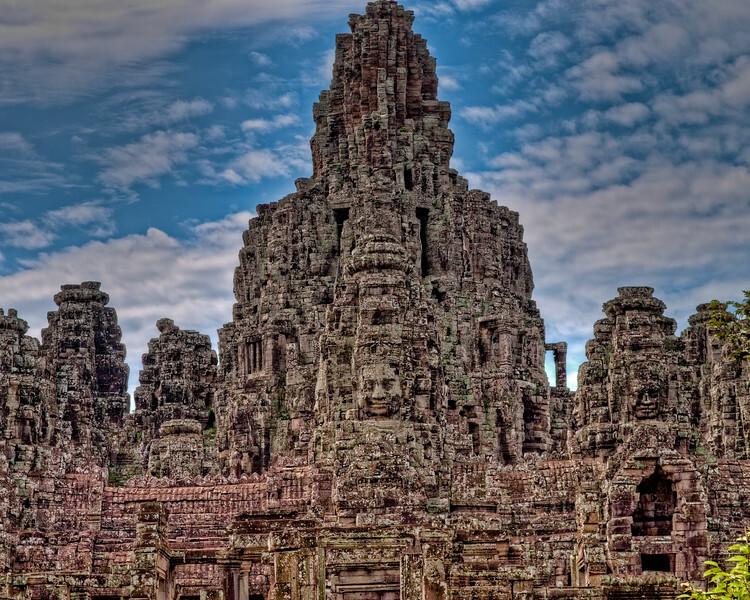 It is amazing that these temples were lost in the jungle for so long. This was one of my favorite photos from the trip because it is the combination of the temples and the surrounding jungle that I remember most from the trip and this photo brings back those memories. 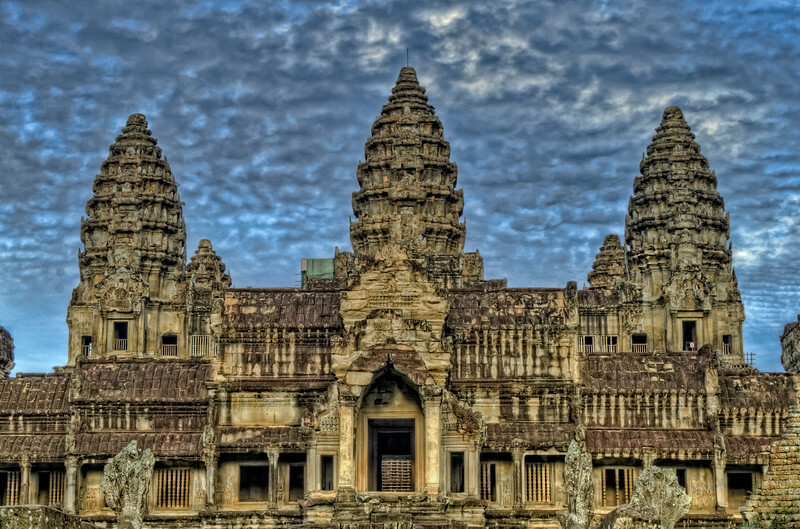 This is the classic temple most people think of when they imagine in Angkor Wat, it is even included on the Cambodian flag. When I went there it was under construction which is what the green sheets are on the front, still not a bad shot even with the construction. 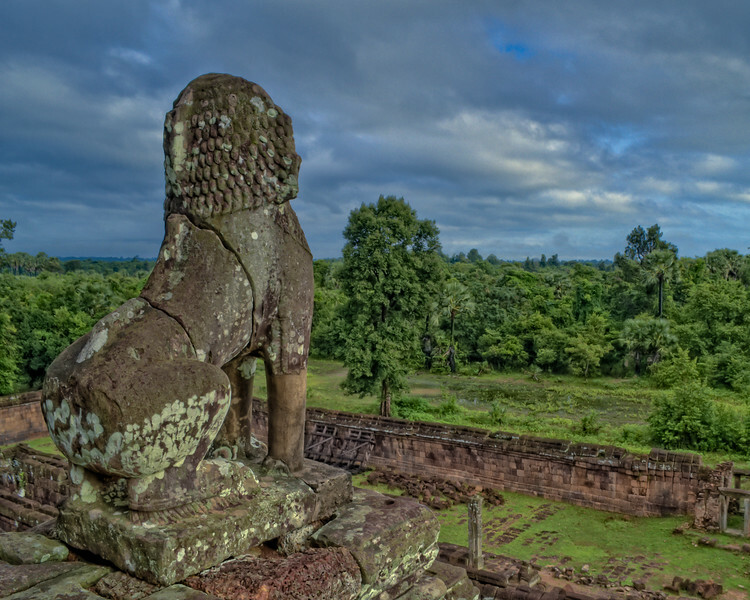 There are many amazing temples at Angkor Wat but around all the temples are the reminants of the temples that have already fallen. The sites of the former temples are marked by piles of the large rocks used to build them so many years ago. 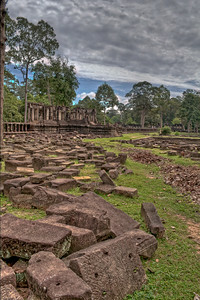 View of one of the temple entrances in Ankor Wat. All these blocks were tagged with numbers and many were hard at work trying to rebuild a temple with the orginal blocks right behind me. On one side of this temple entrance in Angkor Wat was a Buddhist statue, the other side a local was relaxing in the mid day heat. Wonder what he was thinking about in this ancient temple. 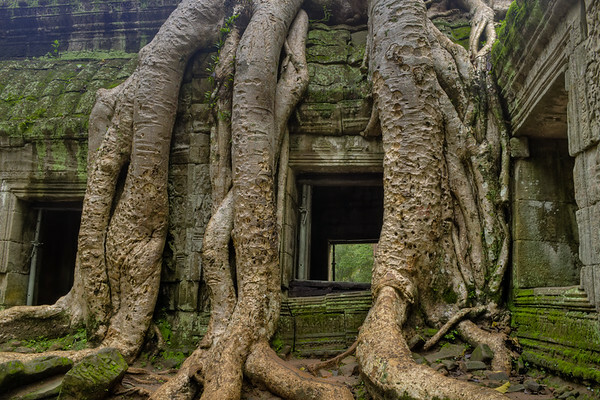 These massive roots hold a tree atop the temple, it is amazing how they have grown right along the walls and have become even more sturdy than the achient temple itself. 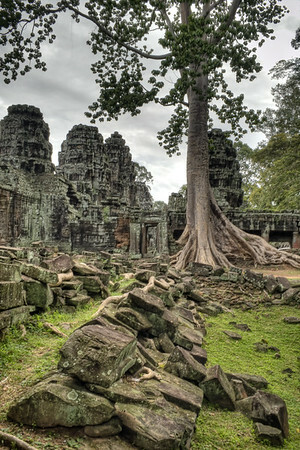 This was our favorite temple at Angkor Wat. We went here during our first day visiting the temples and the second day we decided to return at sun up. We were the only people in the temple for about an hour that morning. It allowed us to explore and experience the temple without the scores of tourists like the day before. Definitely the best way to experience this temple. Amazing temple with faces carved right in to the walls.